Our daughter was here this week for a visit and to spend Halloween with our 6 year old niece. They had a wonderful time Trick or Treating and having a sleep over. Yes, our daughter is 23 and our niece is 6 but they have a wonderful relationship. Jordan is thrilled to have her “big-up” cousin all to herself. While our daughter is in town, I try to make recipes the entire family will eat and will also meet Hanna’s vegetarian needs. I made a Mac and Cheese that was to die for. I had planned to take a photo but it was eaten so quickly by the family that there was none left! I will take that as a compliment. The next night I made this wonderful chowder. 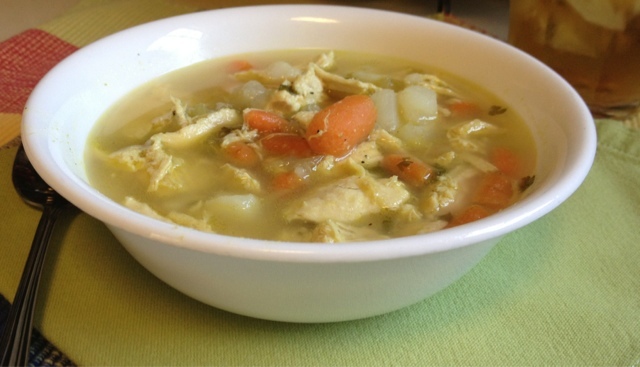 I had found a similar recipe that called for chicken broth and I changed it to vegetable broth and lowered the fat with 2% milk and low-fat cheese. It was so yummy. I will say that the night before my son asked where was the meat. I didn’t think I could get away with having two entirely meat-free dinners in a row. I made bacon and let Stan and Cody crumble it on top. They loved it and it satisfied their need to be carnivores! Melt the butter in a large soup pot. Add onions, carrots and celery. Saute over medium heat until tender. Add garlic and cook 2 more minutes. Add broth and potatoes. Bring to a boil, reduce heat and simmer until potatoes are tender, about 15 minutes. Mix flour and water and add to the soup. Simmer until slightly thickened. Add milk and broccoli. Cook until broccoli is just tender, about 15 minutes. Stir in cheese and heat until melted. I served with a side of Sweet Potato Muffins and crackers. 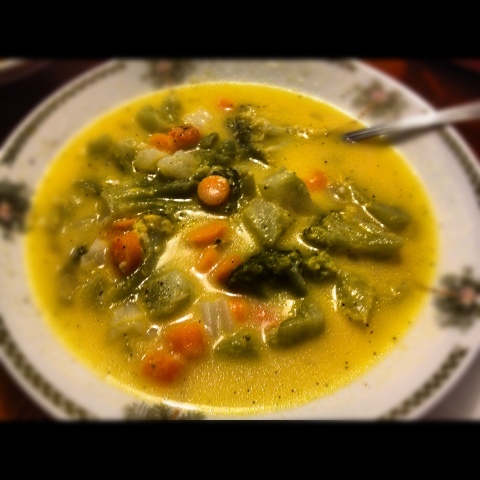 Weight Watcher Wednesday Recipe – Sick friend? Make Chicken Soup! Our friend, Michael, has had a bad case of bronchitis. Ugh! It has been a while since I have been as sick as my poor friend. He felt so bad and of course, was coughing and feverish. What to do? Make Chicken Soup, of course! 5 1/2 cups chicken broth, I use Better than Bouillon. It makes a very rich broth. Over medium heat, heat oil and add garlic, onion and carrots. Cook 4 minutes, stirring occasionally. Stir in rest of the ingredients and bring to a boil. Reduce heat. Cover and simmer at least 10 minutes or until veggies are done. I like to simmer a little longer with the potatoes, about 30 minutes. This is a quick and easy but delicious and filling recipe. Oops! All day yesterday I thought it was Tuesday. You see, these things happen when you stay at home and you are a menopausal woman!! I completely missed my WW Wednesday recipe. So, today, Thursday, I will post the recipe. This Skinny Potato Soup does not taste skinny at all. 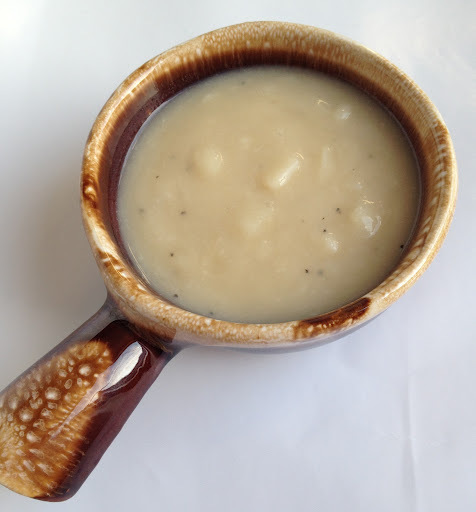 It is creamy and delicious, just like you want potato soup to taste. You can always load it up with low-fat cheese, bacon and onion to make it a loaded potato soup but I find that I enjoy it without the extras. Pour broth in to a large pot. Add potatoes and bring to a gentle boil. Reduce heat and simmer 20 minutes. In a small bowl, blend water and gravy mix. Add gravy mixture to potatoes. Simmer an additional 20 minutes. Serving size is 1 1/2 cups and equals 2 points. This soup is a generous serving and very filling and delicious. I have served this to many people and everyone is astounded that it is fat-free. Enjoy! Do you have a favorite low-cal, low-fat recipe? If so, I would love for you to leave me your link in the comments section! 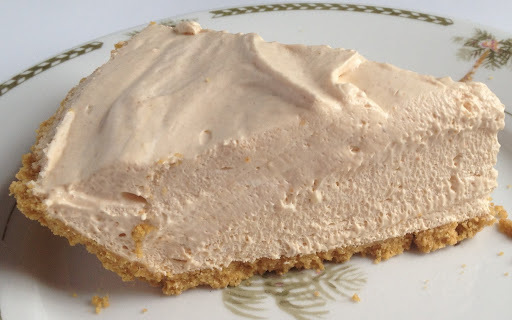 Today, I am highlighting Skinnytaste blog. 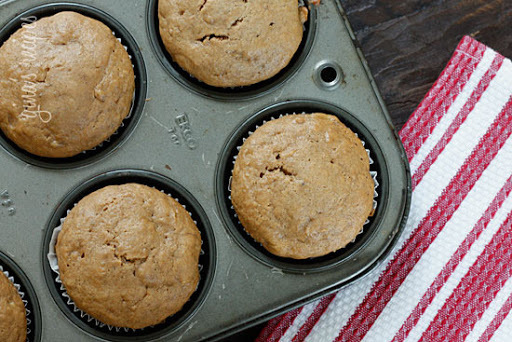 Gina has a blog that offers low fat, family-friendly, healthy recipes. Gina has been featured in several publications and is a wonderful resource for Weight Watcher participants. Gina gives the nutritional value, along with WW points plus values, along with her recipe. I am so excited to have found this blog and know our family will benefit from the wonderful recipes available. I want to thank Gina for allowing me to use her photo and for all those wonderful recipes waiting to be cooked. On another note, I had my second weigh in on Friday. I lost 5 pounds! Yay!